Measuring at intervals, we tracked the most-searched boat brands among the 1.3 million to 3.5 million monthly visitors to BoatTrader.com last year. There were 10.8 million searches in 2012, and more than half a million of them were for Sea Ray models. 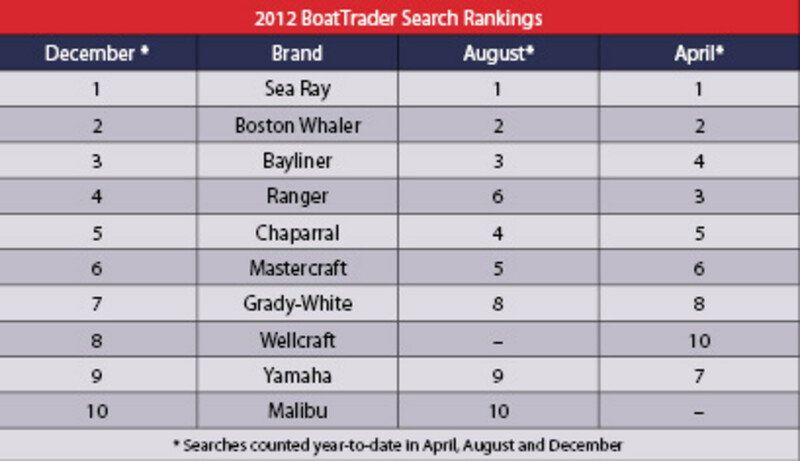 In second and third place were Boston Whaler and Bayliner with more than 200,000 searches apiece. As we’ve seen in past years, the fishing-boat brand Ranger was searched more heavily in the cooler seasons, perhaps because people who were interested in Ranger were busy fishing during the summer. Also as in past years, Chaparral and Mastercraft moved up in the summer and down at year’s end in counterpoint to Ranger. Two other fishing-boat brands — Grady-White and Wellcraft — made strong moves in the latter part of the year. Sea-Doo, which ranked seventh at the end of the summer, slipped out of the top 10.